The Olmecs (/ˈɒlmɛks, ˈoʊl-/) were the earliest known major civilization in Mesoamerica following a progressive development in Soconusco. They lived in the tropical lowlands of south-central Mexico, in the present-day states of Veracruz and Tabasco. 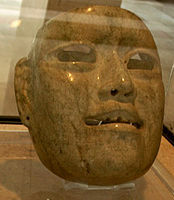 It has been speculated that the Olmecs derive in part from neighboring Mokaya or Mixe–Zoque. Fish Vessel, 12th–9th century BCE. Olmec white ware "hollow baby" figurine, 1000 -300 BC. The Kunz axes (also known as "votive axes") are figures that represent werejaguars and were apparently used for rituals. In most cases, the head is half the total volume of the figure. All Kunz axes have flat noses and an open mouth. The name "Kunz" comes from George Frederick Kunz, an American mineralogist, who described a figure in 1890. This is the second oldest Long Count date yet discovered. The numerals 7.16.6.16.18 translate to 3 September 32 BCE (Julian). 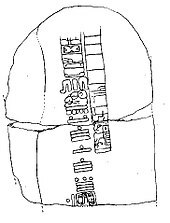 The glyphs surrounding the date are one of the few surviving examples of Epi-Olmec script. As Olmec mythology has left no documents comparable to the Popul Vuh from Maya mythology, any exposition of Olmec mythology must be based on interpretations of surviving monumental and portable art (such as the Señor de Las Limas statue at the Xalapa Museum), and comparisons with other Mesoamerican mythologies. Olmec art shows that such deities as the Feathered Serpent and a rain supernatural were already in the Mesoamerican pantheon in Olmec times. Kunz Axe; 1000-400 BC; jadeite; height: 31 cm (12​3⁄16 in. ), width 16 cm (6​5⁄16 in. ), 11 cm (4​5⁄16 in. ); American Museum of Natural History (Washington D.C., USA). The jade Kunz Axe, first described by George Kunz in 1890. Although shaped like an axe head, with an edge along the bottom, it is unlikely that this artifact was used except in ritual settings. At a height of 28 cm (11 in), it is one of the largest jade objects ever found in Mesoamerica. ^ See Pool (2007) p. 2. Although there is wide agreement that the Olmec culture helped lay the foundations for the civilizations that followed, there is disagreement over the extent of the Olmec contributions, and even a proper definition of the Olmec "culture". See "Olmec influences on Mesoamerican cultures" for a deeper treatment of this question. ^ See, as one example, Diehl, p. 11. ^ See Diehl, p. 108 for the "ancient America" superlatives. 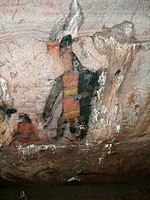 The artist and archaeologist Miguel Covarrubias (1957) p. 50 says that Olmec pieces are among the world's masterpieces. ^ Dates from Pool, p. 1. Diehl gives a slightly earlier date of 1500 BCE (p. 9), but the same end-date. Any dates for the start of the Olmec civilization or culture are problematic as its rise was a gradual process. Most Olmec dates are based on radiocarbon dating (see e.g. Diehl, p. 10), which is only accurate within a given range (e.g. ±90 years in the case of early El Manati layers), and much is still to be learned concerning early Gulf lowland settlements. ^ Richard A Diehl, 2004, The Olmecs – America's First Civilization London: Thames & Hudson, pp. 25, 27. ^ Diehl, 2004: pp. 23–24. ^ Pool, pp. 26–27, provides a great overview of this theory, and says: "The generation of food surpluses is necessary for the development of social and political hierarchies and there is no doubt that high agricultural productivity, combined with the natural abundance of aquatic foods in the Gulf lowlands supported their growth." ^ Diehl, p. 132, or Pool, p. 150. ^ a b Pool, p. 103. ^ Diehl, p. 9. Pool gives dates 1000 BCE – 400 BCE for La Venta. ^ Diehl, p. 82. Nagy, p. 270, however, is more circumspect, stating that in the Grijalva river delta, on the eastern edge of the heartland, "the local population had significantly declined in apparent population density ... A low-density Late Preclassic and Early Classic occupation . . . may have existed; however, it remains invisible." ^ Quote and analysis from Diehl, p. 82, echoed in other works such as Pool. ^ Coe (2002), p. 88. ^ Pool, p. 106. Diehl, pp. 109–115. ^ Pool, pp. 106–108, 176. ^ Pool, p. 118; Diehl, p. 112. Coe (2002), p. 69: "They wear headgear rather like American football helmets which probably served as protection in both war and in the ceremonial game played…throughout Mesoamerica." ^ a b c d e Miller, Mary Ellen. "The Art of Mesoamerica From Olmec to Aztec." Thames & Hudson; 4th edition (20 October 2006). ^ In particular, Williams and Heizer (p. 29) calculated the weight of San Lorenzo Colossal Head 1 at 25.3 short tons, or 23 tonnes. See Scarre. pp. 271–274 for the "55 tonnes" weight. ^ See Williams and Heizer for more detail. ^ Scarre. Pool, p. 129. ^ Wiercinski, A. (1972). "Inter-and Intrapopulational Racial Differentiation of Tlatilco, Cerro de Las Mesas, Teothuacan, Monte Alban and Yucatan Maya," XXXIX Congreso Intern. de Americanistas, Lima 1970, 1, 231–252. ^ Karl Taube, for one, says "There simply is no material evidence of any Pre-Hispanic contact between the Old World and Mesoamerica before the arrival of the Spanish in the sixteenth century. ", p. 17. ^ Diehl, Richard A. (2004). 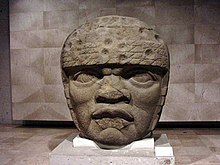 The Olmecs: America's First Civilization. London: Thames and Hudson. p. 112. ISBN 0-500-28503-9. 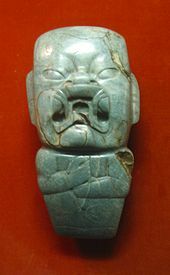 ^ Milliken, William M. "Pre-Columbian Jade and Hard Stone." The Bulletin of the Cleveland Museum of Art 36, no. 4 (April 1949): 53–55. Accessed 17 March 2018. ^ a b c d The British Museum. "Olmec Stone Mask." Smarthistory.com. ^ See Pool, pp. 179–242; Diehl, pp. 126–151. ^ For example, Diehl, p. 170 or Pool, p. 54. ^ Flannery et al. (2005) hint that Olmec iconography was first developed in the Tlatilco culture. ^ See for example Reilly; Stevens (2007); Rose (2007). 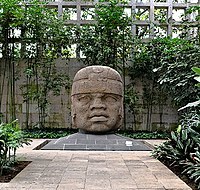 For a full discussion, see Olmec influences on Mesoamerican cultures. ^ See Carlson for details of the compass. ^ Taube (2004), p. 122. ^ As one example, see Joyce et al., "Olmec Bloodletting: An Iconographic Study". ^ See Taube (2004), p. 122. ^ Ortiz et al., p. 249. ^ Pool, p. 116. Joralemon (1996), p. 218. ^ See Pohl et al. (2002). ^ "Writing May Be Oldest in Western Hemisphere". New York Times. 15 September 2006. Retrieved 30 March 2008. A stone slab bearing 3,000-year-old writing previously unknown to scholars has been found in the Mexican state of Veracruz, and archaeologists say it is an example of the oldest script ever discovered in the Americas. ^ "'Oldest' New World writing found". BBC. 14 September 2006. Retrieved 30 March 2008. Ancient civilisations in Mexico developed a writing system as early as 900 BC, new evidence suggests. ^ "Oldest Writing in the New World". Science. Retrieved 30 March 2008. A block with a hitherto unknown system of writing has been found in the Olmec heartland of Veracruz, Mexico. Stylistic and other dating of the block places it in the early first millennium before the common era, the oldest writing in the New World, with features that firmly assign this pivotal development to the Olmec civilization of Mesoamerica. ^ Pohl et al. (2002). ^ Skidmore. These prominent proponents include Michael D. Coe, Richard A. Diehl, Karl Taube, and Stephen D. Houston. ^ "Mesoamerican Long Count calendar & invention of the zero concept" section cited to Diehl, p. 186. ^ Haughton, p. 153. 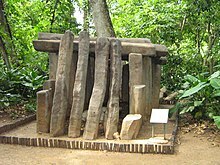 The earliest recovered Long Count dated is from Monument 1 in the Maya site El Baúl, Guatemala, bearing a date of 37 BCE. ^ Miller and Taube (1993) p. 42. Pool, p. 295. ^ See Filloy Nadal, p. 27, who says "If they [the balls] were used in the ballgame, we would be looking at the earliest evidence of this practice". ^ Coe (1968) p. 121. ^ Campbell & Kaufman (1976), pp. 80–89. For example, the words for "incense", "cacao", "corn", many names of various fruits, "nagual/shaman", "tobacco", "adobe", "ladder", "rubber", "corn granary", "squash/gourd", and "paper" in many Mesoamerican languages seem to have been borrowed from an ancient Mixe–Zoquean language. ^ a b Wichmann, Beliaev & Davletshin, (in press Sep 2008). ^ See Pool, p. 6, or Diehl, p. 85. ^ Diehl, p. 106. See also J. E. Clark, p. 343, who says "much of the art of La Venta appears to have been dedicated to rulers who dressed as gods, or to the gods themselves". ^ See, for example, Cyphers (1996), p. 156. ^ See Santley, et al., p.4, for a discussion of Mesoamerican centralization and decentralization. See Cyphers (1999) for a discussion of the meaning of monument placement. ^ See Cyphers (1999) for a more detailed discussion. 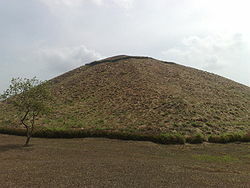 ^ Serra Puche et al., p. 36, who argue that "While Olmec art sometimes represents leaders, priests, and possibly soldiers, it is difficult to imagine that such institutions as the army, priest caste, or administrative-political groups were already fully developed by Olmec times." They go on to downplay the possibility of a strong central government. ^ Hirth, Kenneth (June 2013). 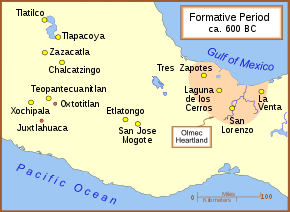 "Early Olmec obsidian trade and economic organization at San Lorenz". Journey of Archeological Science. ^ "Chiapa de Corzo Archaeological Project". Brigham Young University. Retrieved 18 March 2012. ^ Except where otherwise (foot)noted, this Village life and diet section is referenced to Diehl (2004), Davies, and Pope et al. ^ VanDerwarker, p. 195, and Lawler, Archaeology (2007), p. 23, quoting VanDerwarker. ^ See translated excerpt from Melgar y Serrano's original 1869 report, reprinted in Adams (1991), p. 56. See also Pool (2007), pp. 1, 35 and Stirling (1968), p. 8. ^ Quoted in Coe (1968), p. 40. ^ Coe (1968), pp. 42–50. ^ "Esta gran cultura, que encontramos en niveles antiguos, es sin duda madre de otras culturas, como la maya, la teotihuacana, la zapoteca, la de El Tajín, y otras" ("This great culture, which we encounter in ancient levels, is without a doubt mother of other cultures, like the Maya, the Teotihuacana, the Zapotec, that of El Tajin, and others".) Caso (1942), p. 46. ^ Coe (1968), p. 50. ^ The term "tenocelome" is used as early as 1967 by George Kubler in American Anthropologist, v. 69, p. 404. Benson, Elizabeth P. (1996). "110. Votive Axe". In Elizabeth P. Benson; Beatriz de la Fuente (eds.). Olmec Art of Ancient Mexico (To accompany an exhibition at the National Gallery of Art, Washington, 30 June to 20 October 1996 ed.). Washington, D.C.: National Gallery of Art. pp. 262–263. ISBN 0-89468-250-4. OCLC 34357584. Clark, John E. (2001). "Gulf Lowlands: South Region". In Susan Toby Evans; David L. Webster (eds.). Archaeology of Ancient Mexico and Central America: an Encyclopedia. New York: Garland Publishing. pp. 340–344. ISBN 0-8153-0887-6. OCLC 45313588. Coe, Michael D. (1967). "San Lorenzo and the Olmec Civilization". In Elizabeth P. Benson (ed.). Dumbarton Oaks Conference on the Olmec, October 28th and 29th, 1967 (PDF online reproduction). Washington D.C.: Dumbarton Oaks Research Library and Collection; Trustees for Harvard University. pp. 41–72. OCLC 52523439. Covarrubias, Miguel (1977) . 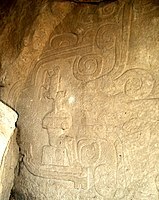 "Olmec Art or the Art of La Venta". In Alana Cordy-Collins; Jean Stern (eds.). Pre-Columbian Art History: Selected Readings. Translated by Robert Pirazzini (Reprint of original paper ed.). Palo Alto, CA: Peek Publications. pp. 1–34. ISBN 0-917962-41-9. OCLC 3843930. Cyphers, Ann (1996). "2. San Lorenzo Monument 4 – Colossal Head". In Elizabeth P. Benson; Beatriz de la Fuente (eds.). Olmec Art of Ancient Mexico (To accompany an exhibition at the National Gallery of Art, Washington, 30 June to 20 October 1996 ed.). Washington D.C.: National Gallery of Art. p. 156. ISBN 0-89468-250-4. OCLC 34357584. Cyphers, Ann (1999). "From Stone to Symbols: Olmec Art in Social Context at San Lorenzo Tenochtitlán" (PDF). In David C. Grove; Rosemary A. Joyce (eds.). Social patterns in pre-classic Mesoamerica: a symposium at Dumbarton Oaks, 9 and 10 October 1993 (PDF online e-text reproduction)|format= requires |url= (help). Washington D.C.: Dumbarton Oaks Research Library and Collection and Trustees for Harvard University. pp. 155–181. ISBN 0-88402-252-8. OCLC 39229716. Archived from the original (PDF) on 17 June 2006. Filloy Nadal, Laura (2001). "Rubber and Rubber Balls in Mesoamerica". In E. Michael Whittington (ed.). The Sport of Life and Death: The Mesoamerican Ballgame (Published in conjunction with an exhibition of the same name organized by the Mint Museum of Art, Charlotte, NC. ed.). New York: Thames & Hudson. pp. 20–31. ISBN 0-500-05108-9. OCLC 49029226. Flannery, Kent V.; Andrew K. Balkansky; Gary M. Feinman; David C. Grove; Joyce Marcus; Elsa M. Redmond; Robert G. Reynolds; Robert J. Sharer; Charles S. Spencer; Jason Yaeger (August 2005). "Implications of new petrographic analysis for the Olmec "mother culture" model" (online reproduction). Proceedings of the National Academy of Sciences. Washington, D.C.: National Academy of Sciences. 102 (32): 11219–11223. doi:10.1073/pnas.0505116102. ISSN 0027-8424. OCLC 209632728. PMC 1183595. PMID 16061797. Retrieved 27 March 2007. Grove, David C. (1981). "Olmec monuments: Mutilation as a Clue to Meaning". In Elizabeth P. Benson (ed.). The Olmec and their Neighbors: Essays in Memory of Matthew W. Stirling. Michael D. Coe and David C. Grove (organizers). Washington, D.C.: Dumbarton Oaks Research Library and Collection; Trustees for Harvard University. pp. 49–68. ISBN 0-88402-098-3. OCLC 7416377. Guimarães, A.P. (June 2004). "Mexico and the early history of magnetism" (PDF online reproduction). Revista Mexicana de Física. Mexico D.F. : Sociedad Mexicana de Física. 50 (Enseñanza 1): 51–53. ISSN 0035-001X. OCLC 107737016. Retrieved 9 September 2008. Joyce, Rosemary A.; Richard Edging; Karl Lorenz; Susan D. Gillespie (1991). "Olmec Bloodletting: An Iconographic Study" (PDF; reprinted online by PARI ). In Virginia M. Fields (volume ed) (ed.). Sixth Palenque Roundtable, 1986. Sixth Palenque Round Table Conference, held 8–14 June 1986, at Palenque, Chiapas, Mexico. Palenque Round Table series, vol. 8. Merle Greene Robertson (series ed.). Norman: University of Oklahoma Press. pp. 143–150. ISBN 0-8061-2277-3. OCLC 21230103. Santley, Robert S.; Michael J. Berman; Rani T. Alexander (1991). "The Politicization of the Mesoamerican Ballgame and its Implications for the Interpretation of the Distribution of Ballcourts in Central Mexico". In Vernon L. Scarborough; David R. Wilcox (eds.). The Mesoamerican Ballgame. Tucson: University of Arizona Press. pp. 3–24. ISBN 0-8165-1180-2. OCLC 51873028. Skidmore, Joel (2006). "The Cascajal Block: The Earliest Precolumbian Writing" (PDF). Mesoweb Reports & News. Mesoweb. Retrieved 20 June 2007. Stirling, Matthew W. (1968). "Early History of the Olmec Problem". In Elizabeth P. Benson (ed.). Dumbarton Oaks Conference on the Olmec, October 28th and 29th, 1967 (PDF online reproduction)|format= requires |url= (help). Washington D.C.: Dumbarton Oaks Research Library and Collection; Trustees for Harvard University. pp. 1–8. OCLC 52523439. Stoltman, J.B.; et al. (2005). "Petrographic evidence shows that pottery exchange between the Olmec and their neighbors was two-way". PNAS. 102 (32): 11213–11218. doi:10.1073/pnas.0505117102. PMC 1183596. PMID 16061796.
von Nagy, Christopher (1997). "The Geoarchaeology of Settlement in the Grijalva Delta". In Barbara L. Stark; Philip J. Arnold III (eds.). Olmec to Aztec: Settlement Patterns in the Ancient Gulf Lowlands. Tucson: University of Arizona Press. pp. 253–277. ISBN 0-8165-1689-8. OCLC 36364149. Wichmann, Søren; Dmitri Beliaev; Albert Davletshin (September 2008). "Posibles correlaciones lingüísticas y arqueológicas involucrando a los olmecas" (PDF). Proceedings of the Mesa Redonda Olmeca: Balance y Perspectivas, Museo Nacional de Antropología, México City, March 10–12, 2005. (in Spanish). Archived from the original (PDF) on 2 October 2008. Retrieved 18 September 2008. Wilford, John Noble (15 March 2005). "Mother Culture, or Only a Sister?". The New York Times. Retrieved 19 September 2008.